Ahead of their talk at Offset Dublin in a couple of weeks we catch up with illustration and animation studio Tado to find out how everything they produce is truly collaborative. When illustration and animation duo Tado started out they only had one computer between the two of them. Tado is Mike Doney and Katie Tang, who started to work together in 2001 when they were studying graphic arts and design at Leeds Metropolitan University. A year later the formative Tado had set up in Sheffield and began to hone illustration, animation and 3D model-making skills. Every character that comes out of the studio is truly collaborative. What began as Doney and Tang taking it in turns to use the single computer – they have one each now – has developed so that anything which has been produced is created by the hands of both of them. 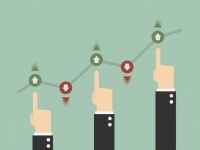 “We learnt Flash at the same time and Illustrator – everything. When we had one computer we’d take it turns to have a go on the Wacom or the mouse,” says Doney. “Each piece that you see has had an equal amount of input into it from both of us. It’s an unusual way of working; We’re like a two-headed creature,” adds Tang. Today they are working on a project for Sky TV and Now TV, which is under wraps for the moment, and a new project for Sheffield Children’s Hospital. The hospital is undergoing a £40 million redevelopment with new wards opening and a reconfiguring, which will see new facilities introduced and a new reception opened, where Tado is designing a moving installation made up of wooden characters. It follows an exhibition Tado did for Sheffield Children’s Hospital last year, the March of the Misfits, which transformed a long A&E corridor into an exhibition space featuring 3D wooden laser-cut characters. 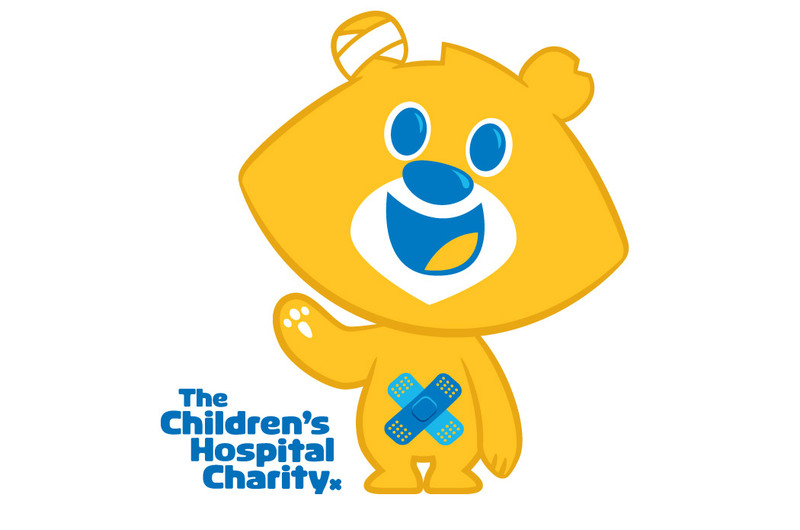 The Children’s Hospital Charity, which is attached to the hospital was rebranded by Peter and Paul, working alongside Tado who redraw Theo, the bear mascot. Their style is “loose and free” and “heavily influenced by comic books”, says Tang, who with Doney could be drawing, painting, animating or using power tools and craft skills at any one time. 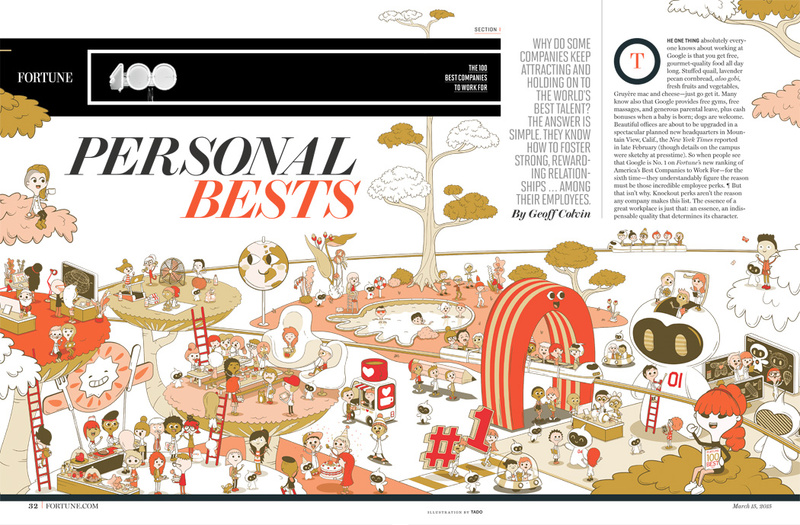 Fortune Magazine’s 100 best companies to work for issue. 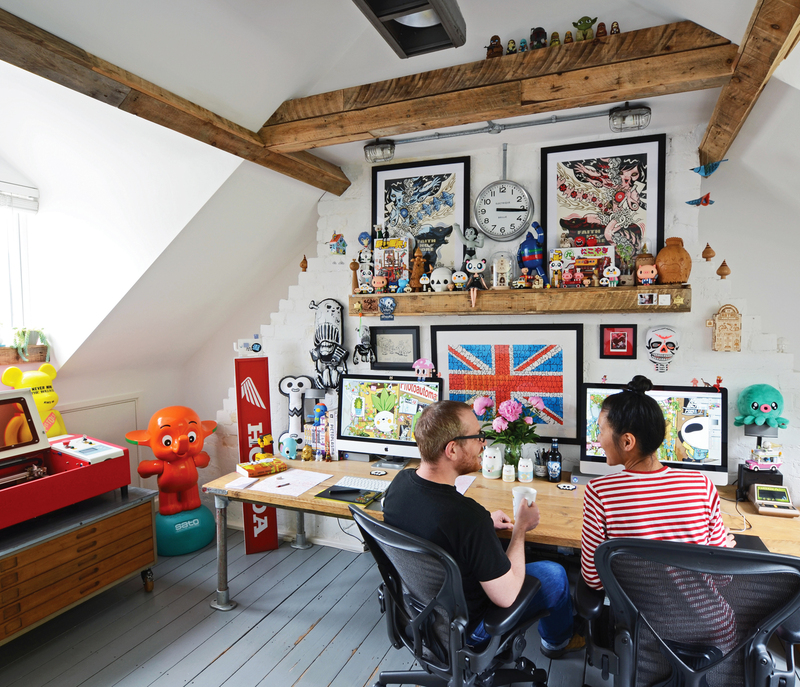 Over the years Tado has come to work with the likes of Nickelodeon, Microsoft, Nike, The Guardian and Fortune Magazine. 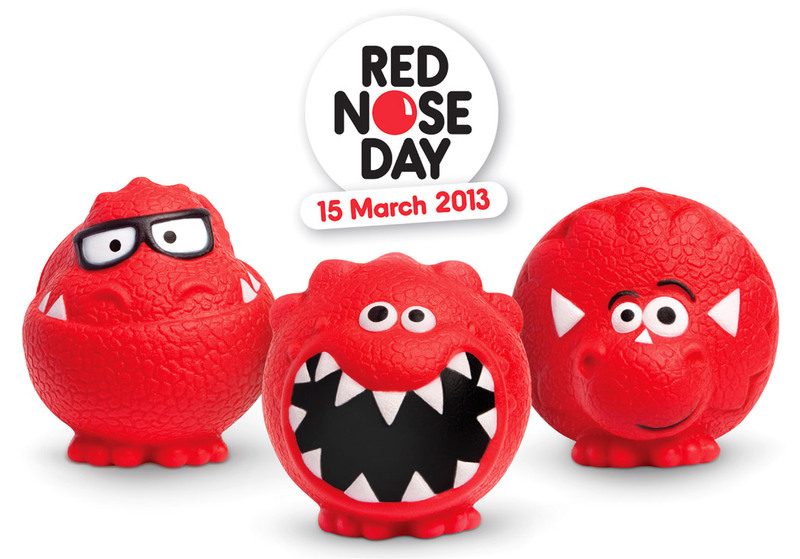 The studio was also behind the illustrations which became the DiNOSEsaurus red noses for the record breaking Comic Relief in 2013. 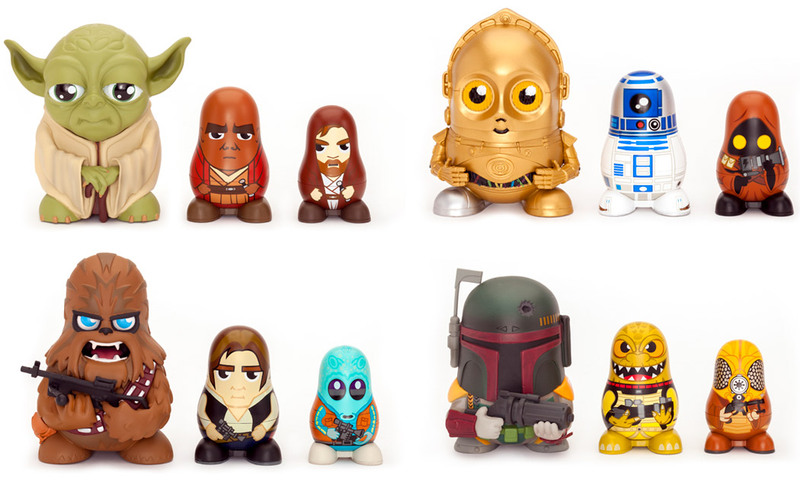 Some beautiful toys have been created, including these rather fun Star Wars Chubbies, based on Matryoshka nesting dolls so that one fits inside another. 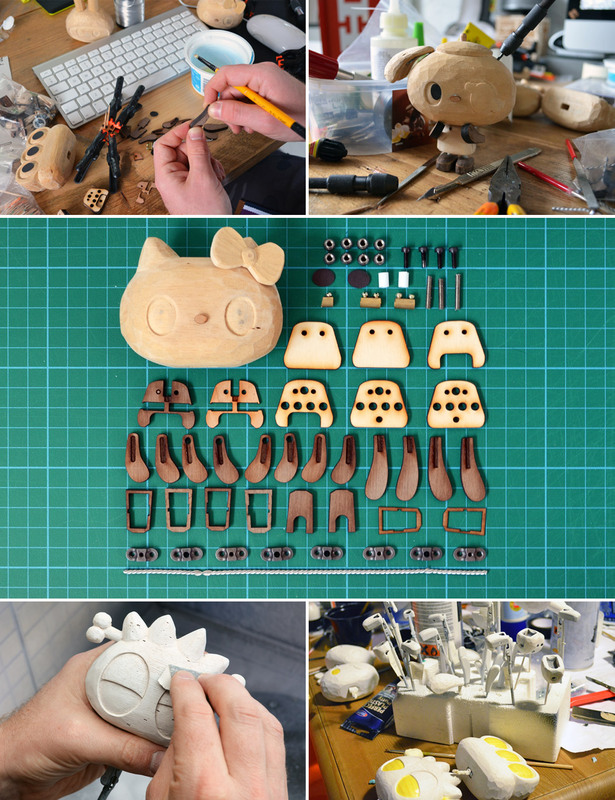 In 2014 Tado took on what Tang calls “the perfect project” – a two minute stop-motion animation for the cartoon character Hello Kitty to celebrate her 40th birthday. It was the studio’s first foray in to stop-motion animation and to make the sequence Doney and Tang storyboarded the whole thing, created wooden puppets and the set before shooting it. “We did the whole thing in our cellar, so we didn’t see natural daylight for a while, but it was worth it,” says Doney. The piece was created for the Japanese American National Museum in Los Angeles as part of a bigger exhibition celebrating Hello Kitty’s birthday. You’ll find the Japanese cartoon theme popping up in lots of their work, which is always playful and energetic and usually infectiously cute. 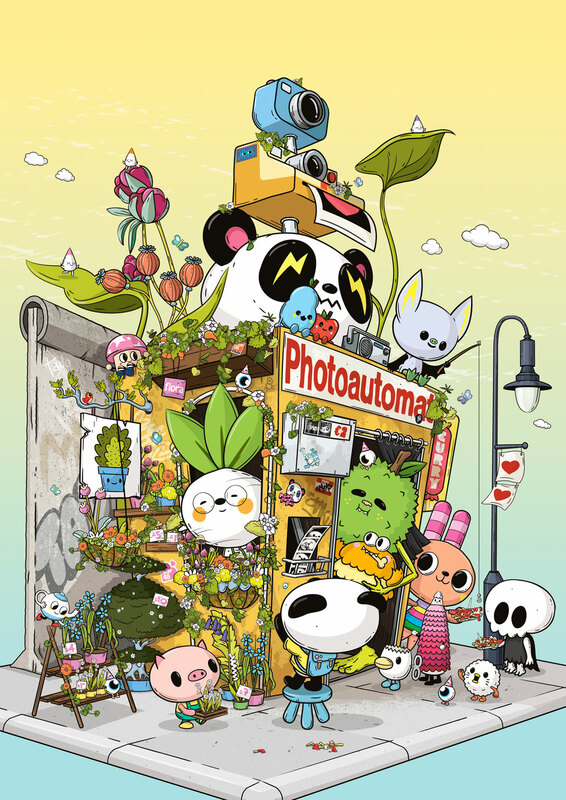 Poster for Canon Asia’s Pixma Town paper-craft project. Tado will be telling their story at Offset where they’ll be talking about why they work in Sheffield, showing project work, revealing how personal work leads into commercial work and giving a better insight into what the latest Sheffield Children’s Hospital project will be like.